Palm Valley Animal Center Director of Development Rebecca Villanueva holds Thea Friday at the Laurie P. Andrews PAWS Center in Edinburg. The cat has been with the organization for more than a year. Villanueva hopes Thea is one of the hundreds of animals that find a home during the "Clear the Shelter" event Saturday. 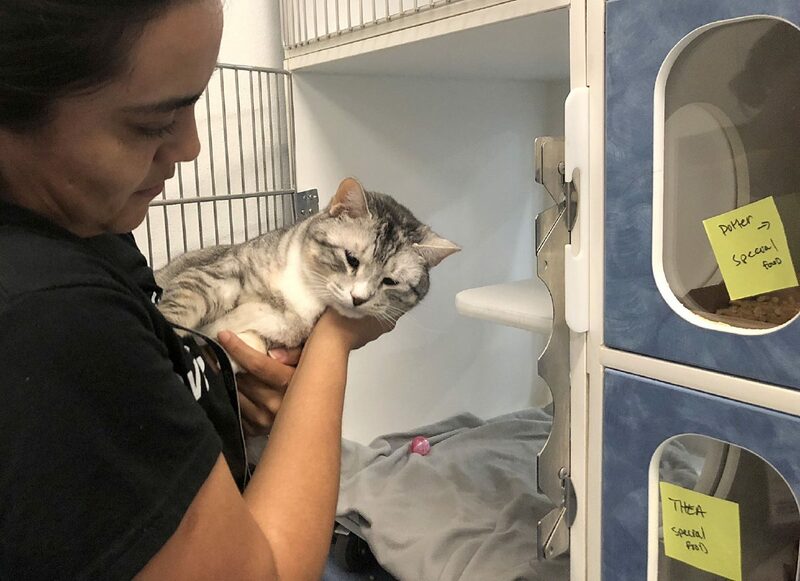 When Thea — now a plump 5-year-old silver and white domestic short-haired cat — arrived at the Palm Valley Animal Center in Edinburg over a year ago, she suffered from intestinal issues. And after an upper respiratory infection, she was at risk of losing her eyesight. “Everybody here is impacted by her and her story,” said PVAC Director of Development Rebecca Villanueva. She held the cat, commenting on her soft fur. After receiving care from the organization, the feline is healthy and available for adoption. Today’s “Clear the Shelters” event will be Thea’s best shot at finding a home, Villanueva said. Palm Valley Animal Center, and the Laurie P. Andrews PAWS Center, will join two other Rio Grande Valley facilities — Sullivan City’s no-kill nonprofit Yaqui Animal Rescue and Port Isabel’s Isabel Y. Garcia Animal Shelter — participating in the national campaign, where adoption fees are waived. PVAC and PAWS open their doors at 9 a.m.
Last year, while only utilizing the PAWS Center, the organization secured more than 320 adoptions. They’ll open both Edinburg facilities this year, and Villanueva said the goal is to find at least 400 animals homes. The staffs at the centers worked this week — coordinating with volunteers, organizing paperwork and microchipping animals — to help the adoption process on Saturday run smoother. Large tents are pitched to accommodate the visitors expected Saturday. Potential adopters are given wristbands and wait in either dog or cat lines. Then, in groups, visitors are taken to see animals. Staff suggests those interested in adoption should arrive early with water, and maybe a chair. Local and national sponsors make the event possible, she said. And while pets won’t cost anything that day, good pet ownership is a big investment and a lot of work, she said. Counseling during the event makes sure people know what they’re getting into. Most of the animals up for adoption are spayed or neutered, but the center will try to find unaltered animals a home. These come with a $50 deposit, and PVAC covers the cost for the procedure. On Friday, staff put together packets with info like house training, illustrations interpreting the body language of animals and a rundown of symptoms to common ailments new owners should look out for. Staff will just need to add the newly-adopted animal’s medical records to the materials on Saturday. “We try to give them as much information as we possibly can,” said Renee Ramirez, PVAC adoption specialist. Some people came in on Friday to start paperwork and see which animals they might want, she said. Interaction will be limited on Saturday because of the number of people expected. Admitting side is closed to the public tomorrow, but they’ll still taking from animal control during the event. PVAC took in 40,637 animals in 2017. Of those, lost animals accounted for 1,653, PVAC adopted out 2,785, and 6,031 were sent to rescues. The organization posted a nearly 35 percent live release rate in 2017, and was just over 50 percent as of May. The group underwent changes after a controversial video of the facility surfaced in February sparking criticism on social media. In May, PVAC announced their pursuit of no-kill status, requiring a more than 90 percent live release rate. The organization has previously said the backlash wasn’t a determining factor to pursuing that goal.